Plans for a major transformation of Aberdeen's Union Terrace Gardens should be scrapped, it has been claimed. 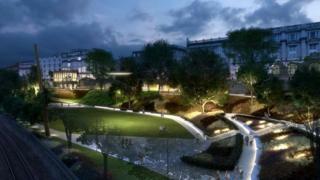 The £25m proposals include new walkways, an amphitheatre and a cafe. However Aberdeen's SNP group now claims predicted cost increases alongside the council's "financial situation" mean the Conservative and Labour administration should drop the plans. Earlier this week it emerged about 200 jobs could go at the council amid almost £45m of budget cuts. A 4.79% rise in council tax is being proposed. SNP group leader Stephen Flynn said: "Union Terrace Gardens is a much-loved asset that has become tired and inaccessible for so many people and we will be proposing that action is taken to resolve these issues but that does not need to cost anywhere near the projected costs." Aberdeen City Council has been asked for comment.